The P.V.T. 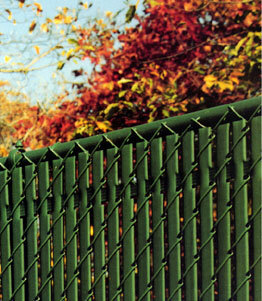 Fence Slats are flat\tubular in shape with a wall thickness of .0030" +/- .03". 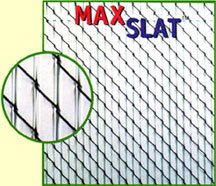 The slats come in four different widths; 1.0" +/-.030", 1.125" +/-.030", 1.250" +/-.030", and 2.375" +/- .035". The size specification chart above shows the fence mesh to slat width specs. The depth of all four slats is .325" +/- .025". 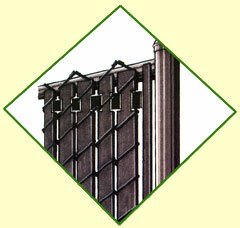 The length of the slats are 2" +/- 1/4" shorter than the height of the chain link fence. The fence slats are manufactured from a combination of quality base high density virgin polyethylene; color pigments, and ultra violet inhibitor, specifically designed to retard the harmful affects of sunlight and lengthen the useful life of the product. The P.V.T. slats have a wind load factor of 75% when installed. 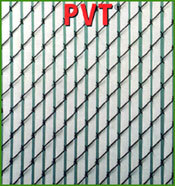 PVT slats carry a full 15 year warranty against fading and breakage under normal use. Write the factory for full warranty information.